Or The real reason I’m not in charge of the bake sale at school. Or Why I love Wednesdays. We spent the morning tithing Dan’s paycheck to Costco and shelling out $179.00 for an oil change after the mechanic convinced me that I’d probably wreck the car and combust the baby if I drove around for another minute on my old serpentine belt. And that he just couldn’t let me go into the winter season with wipers in such bad shape. And that synthetic engine oil is so pure I’d surely notice the difference once I switched over, as if. I texted Dan to let him know oil changes are now his responsibility. After all, ten out of nine studies show that if you want to get out of doing something, do it so poorly that they’ll never ask you again. We headed home to regain our confidence and prove that a woman’s place really is in the kitchen. So I made chocolate chip cookies for a special after school treat. Lucky for them that’s not the only trick I have up my sleeve. There is also squash roasting in the oven and applesauce bubbling on the stove, neither of which they will probably like because the squash will have a weird consistency and someone will find a toenail (seed pocket) in the applesauce. But all three things felt like the right thing to do on a cold, rainy fall day when your baby is sleeping and you could be too. So, why this cookie handicap? 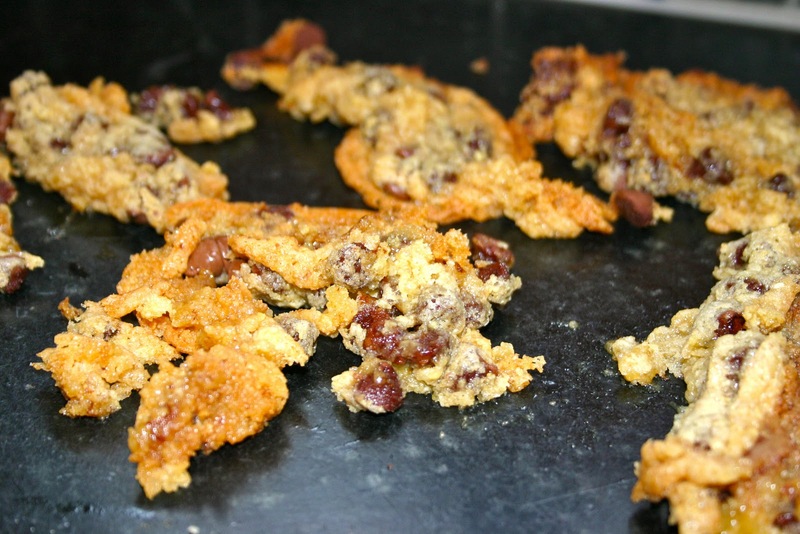 If there is anyone out there schooled in cookie chemistry, please weigh in, because I have never, ever made a batch that has turned out. At this point my friend Andrea (you know who you are), if she ever read my blog, would be laughing hysterically. As it is, I’ll have to text a picture to her to get the ball rolling. She’ll think I’m an idiot, which I undoubtedly am, and then we’ll dish over what gluten free, dairy free, sugar free dye-free dinner we’re making for tonight. None of this will make me feel like less of an dummy. Which is why it’s easier to either hate cookies or just eat the dough raw, check and check. In an effort to save face, I have scraped these geriatric bits of former gluten free goodness off my last remaining cookie sheet and am soaking them in milk in the hopes that they recover some of their moisture and form before the bus pulls up at 4:15. And if I wasn’t taking the girls to Post Family Farms in the morning to see our favorite Great Aunt Joy flip doughnuts I’d be totally in despair over what to bake for the play date I’m having here in the afternoon. Instead I’ll just buy an extra dozen and call it good. And if either of the women asks my secret I’ll tell them to leave the baking up to Great Aunt Joy. Or Betty Crocker. This is me being real. 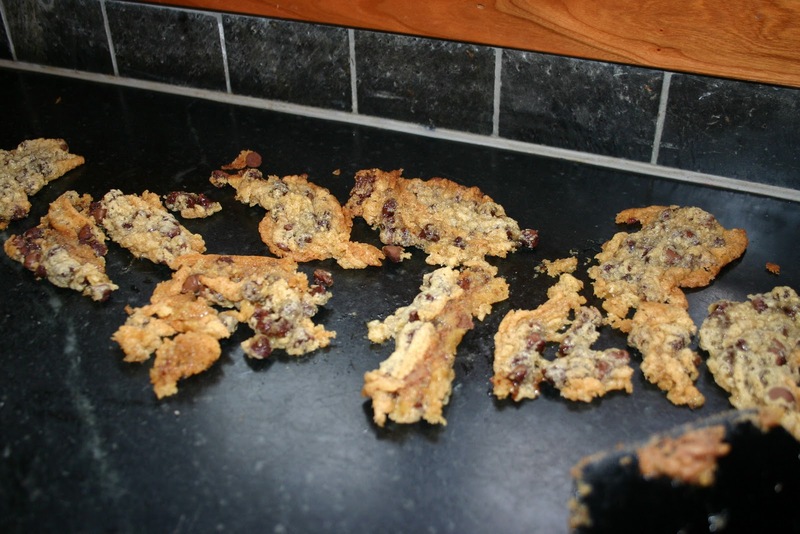 Crappy at baking. Good at humility. Is that cookie dough. I thought it was bacon that hadn't browned yet. I love ya Meggie, but you need to have a cookin lesson from yer old nanny burd. Actually about 2 days into “boot camp” even those will look remarkably good. On Tues I'm gluten-free, dairy-free, sugar-free, fun-free, taste-free for 9, as 1,2,3,4,5,6,7,8,9 weeks. Thanksgiving is at your house this year, cause I'll be dead by then. Love, really love the post. I'm going to print it out and hang it in my kitchen as an incentive. Allie, I completely agree. No more cookies, only dough. And mom, misery loves company. Welcome to our h-e-double toothpicks. You'll eventually feel great. Just not for awhile. So when you get food depressed, just call me and I'll talk you off the ledge. okay. what is the point of this gluten free, dairy free, sugar free diet? Seems like there isn't much left to eat, at least anything worth eating!! I'm great with baking. I love making cookies and sweets, and I'm actually really good at it. But cooking is another story completely. I have a few recipes that turn out, well, I call them recipes. Aaron disagrees, he says adding chicken to rice-a-roni and melting cheese to the top isn't actually a recipe or cooking. Rebekah, I just discovered you have a blog of your own. And since you list settling down to freshly made cookies in your profile, I'm assuming you're pretty good at it. So jealous. Been trying to get a hold of you for weeks. Shoot me your email will you?